Neurofibromatosis (commonly known as NF) is a genetic disorder of the nervous system that affects all genders and ethnic groups equally. Neurofibromatosis (NF) is a genetic disorder which causes tumors to form on the nerves anywhere in the body at any time. 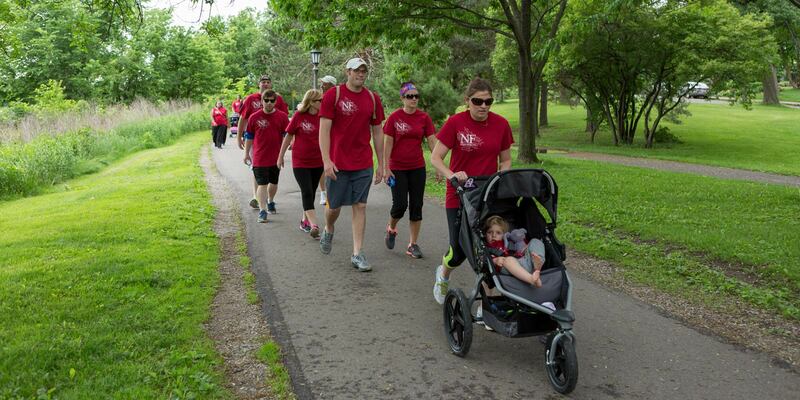 NF is one of the most common genetic disorders in the United States and affects more than 100,000 Americans. NF has three genetically distinct forms: NF1, NF2 and Schwannomatosis, which are caused by different genes and chromosomes. What are the different types of NF? Who is most likely to be diagnosed with neurofibromatosis? Neurofibromatosis affects all races, all ethnic groups and all genders equally. NF is most often diagnosed at birth or in early childhood. Does NF run in families? Neurofibromatosis can either be inherited or result from a gene mutation. Children have a 50% chance of inheriting the genes that cause NF if their parent has NF. If the gene is passed on, the child will inherit the same type of NF as the parent. The only difference is the severity and symptoms of the disease. To be diagnosed with NF1, patients must show at least two symptoms associated with the disease. Doctors often use special lamps to check the skin for café au lait spots. They may also use MRIs, x-rays, CT scans or blood tests to detect abnormalities in the gene that causes NF1. For a diagnosis of NF2, doctors will often use hearing or imaging tests to look for tumors around the nerves of the ear, spinal cord, and brain. Family history also plays a large part in confirming a diagnosis. Genetic testing is often used to diagnose neurofibromatosis as well. Prenatal tests are recommended for women who have a family history of the disorder, but may not have symptoms. What are the symptoms associated with neurofibromatosis? Depending on the type of neurofibromatosis, symptoms can include café-au-lait (light brown color) spots on the skin, small bumps (neurofibromas) that grow under the skin or on nerve tissue, freckling, Scoliosis, tinnitus (ringing ears), vision and hearing loss, cataracts, bone deformities, learning disabilities, speech impairments, chronic pain and itching, early or delayed puberty, and low muscle tone. Though there is no cure for neurofibromatosis, there are a variety of treatment options available to help alleviate symptoms. Surgery can be used to remove tumors under the skin, though there is a risk they will regenerate. Radiation or surgery is often used to treat tumors on the optic nerve. For scoliosis, treatment can include surgery or back braces. With NF2, although surgery may be an option, it can often result in complications that lead to additional hearing loss (particularly since hearing aids are ineffective when parts of the auditory nerve are removed).